Reactive Platform is an application development framework and runtime solution for creating reactive systems - elastic, resilient, responsive, message-driven. Breathe new life into legacy systems with an asynchronous, message-driven approach that integrates with Java and Scala libraries and tools, as well as IDEs, DBs and Fast Data systems. Capitalize on high-velocity, high-volume data streams by building reactive systems of microservices with Reactive Platform for enterprise AI or cognitive solutions. With Development Accelerator, gain access to the tools and experts to accelerate learning and support project success by removing development blockers and promoting knowledge transfer more seamlessly. 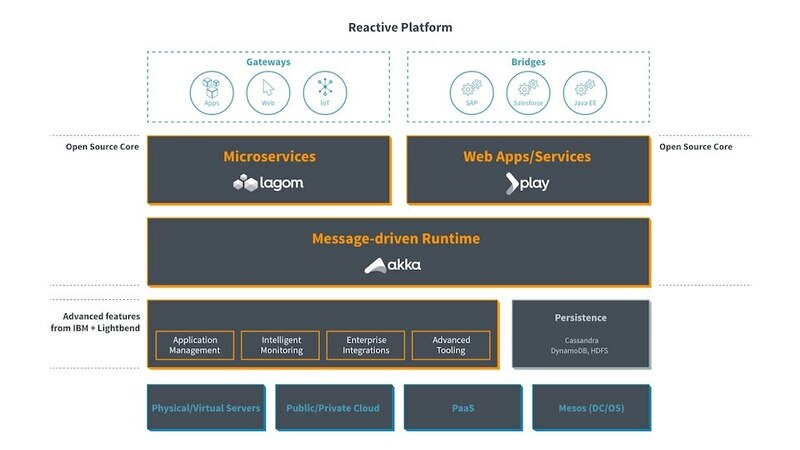 Reactive Platform Open Source Core is comprised of Akka, Play and Lagom, the key open source software projects underpinning the commercial product. Reactive Platform Development Accelerator gives developers access to tools, software and subject matter experts to speed development of reactive applications. Reactive Platform is a full function development platform and production run-time environment for reactive solutions on the JVM using Scala or Java.